Lock in a great price for Río Serrano Hotel + Spa – rated 8.8 by recent guests! My husband and I had an amazing time at Rio Serrano. Although the hotel was a far drive from our stay in El Calafate, Argentina (5 hours) - our time was very well spent. - The remote location is gorgeous and the hotel interior and exterior is curated to take full advantage of the landscape. - Every interaction we had with the staff made us feel like friends, not just guests. - The spa staff was incredibly professional and the services were timely and well priced. - Every meal we ate was extremely well executed - both in appearance and taste. - Our excursion was the highlight of our stay - a beautiful drive to the most scenic locations in the park. The view was fabulous. The restaurant had great food! The bed was very comfortable. The staff was very helpful. We enjoyed all of our excursions that the hotel arranged. Your guides were very knowledgeable. Great way to travel if you don’t want to think about anything but not cost effective. Can't recall the young man's name who waited on us in the bar area but he was fantastic. Also loved the special horseback riding excursion with Karem and Romero. That was special. Every room has a truly spectacular view. The pool and spa facilities were incredible, as were the common areas (like the bars and sitting lounges). It made a fabulous place to return to after a day of hiking. Also, the breakfast contained a lot of options and the food was better than I’d anticipated (considering it is a remote location). We also loved the location. It allowed east access to the southern parts of the park. Staff is friendly and accommodating. Breakfast is good. The location was great and the views were amazing. The room was comfortable and the staff was friendly. The breakfast was good with a good variety. Otherwise food options were a bit limited at the Bar Dickson. We booked superior room and a view from our room is stunning as promised! Dinner was delicious. I wished I have more time there. Río Serrano Hotel + Spa This rating is a reflection of how the property compares to the industry standard when it comes to price, facilities and services available. It's based on a self-evaluation by the property. Use this rating to help choose your stay! One of our top picks in Torres del Paine.Offering standard rates and all-inclusive rates which include full-board and additional programs, Hotel Río Serrano is in Torres del Paine. There is an on-site restaurant and a garden overlooking the Paine Massif. Free WiFi access in available in common areas. Fully carpeted, rooms at Rio Serrano have large windows offering scenic views of the Massif. All of them have heating, fans and private bathrooms. A buffet breakfast is served daily. Guests traveling with the all-inclusive program have complimentary breakfast, lunch and dinner. Regional specialties can be ordered at the restaurant, while enjoying one of the many wines from the property’s cellar. Drinks and cocktails can be enjoyed at Dickson Bar. Boat trips, hiking and horseback riding activities can be practiced. Additionally, guests can explore the areas choosing from several available excursions, for an extra fee for standard rates and included for all-inclusive rates. Hotel Río Serrano is 52 mi from Puerto Natales and 202 mi from Ibañez del Campo Airport in Punta Arenas. It is 2.5 mi from one of the entrances to Torres del Paine National Park. Shuttle services can be arranged for an extra fee. All-inclusive rates have complimentary shuttle services. Free parking is provided. Premium wireless connection is offered for a surcharge. When would you like to stay at Río Serrano Hotel + Spa? This triple room has a soundproofing and patio. Superior room which offers a view of Paine Massif. • Transportation IN/OUT Punta Arenas / Puerto Natales or Cerro Castillo to Hotel Río Serrano round trip. • Entry tickets to Torres del Paine National Park. • All excursions listed with bilingual guide included. • WIFI in room and common areas. • 35% Discount for 1 relaxation massage per person (nontransferable service, service not available for children). * Wine glasses and drinks for a value up to US $10. ** Box Lunch included in Transfer IN. * Transfers in regular service at fixed times, only with driver. * As an option it will also be feasible to book Navigation Lago Gray and Navigation Balmaceda & Serrano for an additional price. This twin/double room features a seating area, soundproofing and view. Set in one of the phenomenal location, 7 kilometers from one of the principal entrances of Torres del Paine National Park. This unique and breathtaking hotel, combines the highest level of hospitality, design and comfort to provide an elegant, yet warm place to relax and feel in touch with the surrounding nature. House Rules Río Serrano Hotel + Spa takes special requests – add in the next step! Río Serrano Hotel + Spa accepts these cards and reserves the right to temporarily hold an amount prior to arrival. Please note, when making your reservation, that the property offers regular rates and all-inclusive rates. Regular rates are per night and include breakfast only. All-inclusive rates can be booked for 3 or 4 nights and include all meals and several additional services. To see more details, please search 3 or 4 nights and the package will be shown in the Double Superior Room description. There is absolutely nothing to dislike!!! The scenery!! Did I mention scenery!? From the minute I arrived Inwas greeted with a smile! Natalie, did I mention Natalie who worked with me via email prior to coming and was so patient...with my worries.. she arranged to have my luggage picked up at Laguna so I could go on with my W trek , she arranged and checked on numerous shuttles and options for me!! My luggage arrived and was stored safely for 6 nights! When I arrived my room wasn’t yet clean so I was upgraded to a room with the most beautiful view of the Massif! Such a lovely walk around the grounds. The decor, food is outstanding! In the evening I received a knock on my door with the delivery of a warm mellinial tea thermos which I sipped while enjoying the incredible view. Condors flew by. I can’t say enough! The rooms are so comfortable and after a week doing the W trek and Refugio’s (which were wonderful), I felt wrapped in comfort and care. The bath products were fabulous! Thank you everyone esp Natalie who helped to get me here: she went above and beyond! 💛🧡❤️ Yet all of the staff were superb! everything was amazing. perfect spacious and confortable room, the spa and pool were GREAT, the views from the the common areas were to die for (with the added value of having a kid's room where little ones can play while parents enjoy a cocktail at sunset! ), restaurant was amazing, and most of all the staff, who went above and beyond to help us in everything! thanks so much for everything! we had the best time and have recommended your hotel to everyone! We were 15 minutes late to a spa service and the staff told us they were unable to accommodate us because the spa closed at 8 pm. For the amount of money we spent at the site during the week we were disappointed to not be able to enjoy the chocolate ritual on our final night. One of the rooms we stayed in looked very old, smelled musty, and potentially had mould in the closet. We also let the circulation on in the bathroom because if we didn’t it would smell like sewage. However, when we were moved to another room when the hot water stopped working, it was much more modern, didn’t smell and was much more roomy. Try and ask for a better room if you’re not happy with it when you check in. The box lunch is also expensive and not tasty. Some facilities such as the gym were very poor. It was a small room with some equipment but no aircon! The hairdryer in the first room we had (as we had to change rooms due to wetness from the rain one night coming from the patio) was like a 1970s hairdryer which sucked up all your hair and didn't dry anything. The staff were also pretty non plussed about helping you both at reception and at dinner. The excursion people seemed to know very little about the weather and trails although there were one of two we did manage to catch who were very knowledgeable.. Also while the views are really great from the hotel, you should note that to get to most trails you will need to drive over rough roads for 45mins-1.5 hours. However if you stay in the park you will have to pay much higher prices for the convenience! I didn’t like the expected topping which was on top of the high price tag. Thought the price was a bit high for the accommodations. Waited forever for someone to wait on us in the dining room at dinner, and finally just got up and left. The cost of dinner, because we weren't part of a tour group, was ridiculous. Nothing! It’s pricy but totally worth the splurge (especially considering the other options for being in or around Torres del Paine). Welcome drink. Breakfast is abandunt and great. The room with good mountain view. I really, really hope the hotel takes onboard all the bad reviews about the restaurant. Although not hideously expensive, the menu is weird and the food poor. Unfortunately even the bar menu didn’t offer basics like sandwiches and salads, mostly strange mixed plates and dry burgers. My advice would be to fill up in the refuge restaurants in the park and avoid eating here. The location couldn’t be better. 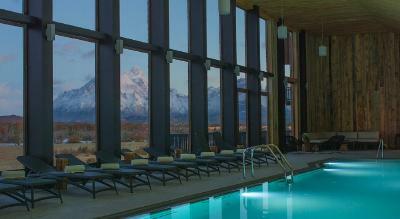 Sweeping mountain views with Torres Del Paine National Park on your doorstep. Comfy rooms and beds, really lovely spa and wellness area.